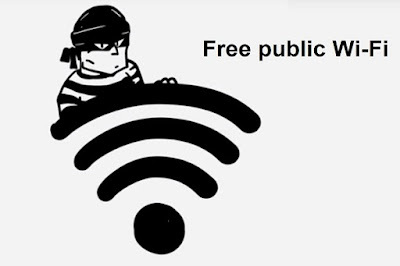 Free public wifi become an open and easy option to get connected with the internet. In different places where we travel like; in cafe's, restaurants, hotels, offices, trains and everywhere offer free on the go wifi services to the public. And we people get easily connected with those free wifi hotspots. We browse social media accounts, surf websites, do an online transaction, check bank accounts, and everything for free. But do you know these free wifi services can steal your personal information when you are connected with it. All your important information like; login ID's, passwords of your social media accounts, bank credit card details, email account details can reach into the hands of hackers. Even the files you are transferring can also be hacked when you are connected with these public wifi's. One of the most common fear to be cheated with is fake wifi connections. These fake wifi hotspots are used by cybercriminals to access valuable information of users. The second most common danger is MitM, Man in the middle attack. Suppose you are transferring information with a website. Now if any cybercriminals find any vulnerability in the network, then all your private information get accessed by the attacker. Public wifi can also be used to distribute malware. Hacker can use malicious software to read private data of users via your device. Various malicious software are used which prompt user to act on it. And later it is used to leak user information and files. When we connect with public wifi the communication happen between your PC and the wireless router you are connected with. The router maintains the security into the network by following some encryption techniques. But if the router encryption is disabled then your personal information will be at risk. Public wifi safety becomes a big concern nowadays. As we know in these busy world we are mostly doing our work online. And it is common to use public wifi hotspots when available. Here are some tips to access that public wifi with safety. 1. Use a VPN (Virtual Private Network). Though you are accessing information through an unsecured connection, your data will be encrypted by using a virtual private network. 2. Enable the ''Always use Https'' option for browsing. When you are browsing on public wifi networks, use only those sites that are using Https. Https is a secure protocol that encrypts user data in any kind of network. 3. To make an online transaction, use sites that support SSL(Secure Sockets Layer). 4. Turn off the sharing option. Especially when you are accessing any public network. 5. Keep your Bluetooth or wifi off when you don't need it. 6. Log out of any kind of account when you stop using them. 7. Keep your OS and Softwares up to date and turn your firewall on. 8. Disable automatic connect option. Set your device to "Ask to Connect" option, so that any open networks do not get automatically connected to your device. 9. Most importantly try to avoid accessing private or financial portals that contains valuable information. 10. Most common wifi hotspots appear with a lock sign which asks for passwords or OTP. So it is better to avoid any freely open wifi network.